With so many great books out there and so little time, too many titles just pass us by. 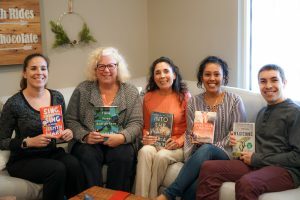 With a shared love for reading, a small group of us here at DutchCrafters formed a book club called Books Without Veneers, a take on Work Without Veneers, which represents for our company commitment to authentic, solid work of substance. Books Without Veneers is determined not to let all those great books get away. Each title we read is selected by popular vote. Beth: What do you all look for in a book? What makes you select a particular book to read? Maribel: The summary just really has to pique my interest. I like romance, comedy, mystery and drama. Jake: I trust reviews and best seller lists, and I generally like books that are highly reviewed. I can go for just about any genre as long as it is well written and people are talking about it. Kari-Jo: I like some sort of excitement or action. I usually go to the library and pick out a science fiction paperback that not many people would check out. They are generally ones that people aren’t talking about. I like twists to the story. I don’t want predictability. Sara: I find myself choosing books that are part of a series. I really like following the characters through the years. I am currently reading The Kingdom of the Blind by Louise Penny, it’s the latest in a series (#14). It’s hard for me to branch out into different genres, so the book club has been fun…pushing me to read books outside my usual sphere. 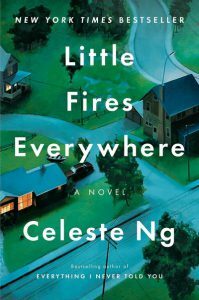 Here Books Without Veneers shares what we’ve read this year just in time for Christmas. Would one of these titles make just the right gift for someone special? Quentin Coldwater finds out that magic is real. When the Brakebills University for Magical Pedagogy accepts him, he begins his training to become a magician. His path to earning his degree as a true magician is littered with challenge and ultimately, he finds himself face-to-face with using dangerous magic in an ultimate struggle to destroy the Beast. Kari-Jo: I liked how they traveled to other worlds in this book. 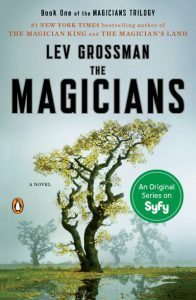 Jake: I liked that the author created a world about magic that included imperfections. There were weird things that happened, and there were depressed magicians. It was not a magical perfect hero story. Maribel: Every time they thought they fixed one thing, something else went wrong and it kept the story moving forward. When the Richardson home catches fire, arson is suspected. But who started the fire? The paths of two families cross in this story set in Shaker Heights, Ohio where the author grew up. Mia Warren and her teenage daughter Pearl come to town and rent the upper floor in one of Elena Richardson’s rental properties. Pearl becomes friends with Elena’s son Moody and meets his siblings—Lexie, Trip and Izzy. Ms. Richardson runs her life on rules and the way she believes things ought to be. Mia is more of a free spirit and when Pearl comes to idolize the home and lifestyle of the Richardsons, forces are set in motion for Mia and Elena to go head to head. This is a story that looks at motherhood in depth and up close. Jake: This is my favorite of the books we read so far. No one character stood out; the author did such a good job of helping me understand every character and seeing their perspectives. Sara: The town was kind of like a character itself, which is kind of unusual. It was my favorite of what we read. Maribel: Each character had their faults. I do wish they would have gone further with Trip’s character. 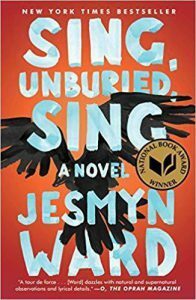 The pain on the pages of Sing, Unburied, Sing is almost palpable. Jojo is thirteen and has a mother who is a drug addict and a father who is in jail. He is just a child but takes on a lot of responsibility helping to care for his little sister Kayla. They live with his grandparents, and his Mam is sick with cancer and his Pop offers the only real guidance in his life. When his father is to be released from prison, Jojo and little Kayla go on a road trip with their mother to pick him up. The stories behind the story are rife with injustice, tragedy and misunderstanding. Kari-Jo: The author kept me turning the page and kept me wanting to know what would happen. You really feel for Jojo and the writing was great at creating emotion. Maribel: It was my least favorite book. Jake: It’s worth noting that it’s not for everyone. There’s an element of hopelessness that’s very realistic for people growing up in poverty, and it makes it hard to go back to that world in the book repeatedly. Kari-Jo: I liked the supernatural element throughout the story. The story of parents not accepting the romantic choice for their child is re-told here. Rachel, the young heroine, is in love with Nick who takes her home to meet his parents who feel she’s not a suitable choice for their son. The reason? 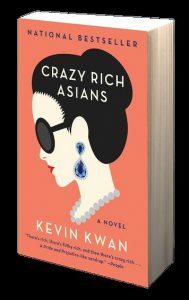 Nick’s family is over-the-top filthy rich beyond anyone’s wildest dreams and cultural precepts create a heavy influence. Kari-Jo: There’s a great level of detail throughout the story. I thought it was interesting how some of the rich would spend extravagantly but would be determined to save on other things. Like when they walked through the rain instead of taking a taxi to save money, but then they bought the hotel that tried to turn them away so they could stay there. The absurdity of it is hilarious. Sara: The part of the story that Nick doesn’t tell Rachel about his family’s wealth is insane. 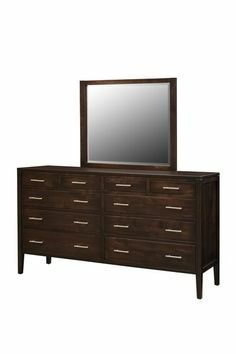 Nobody goes out with someone these days without checking them out. You know she’s gonna Google him. Nel, a single mom, goes off a cliff and into the water. Did she jump? Was she pushed? Nel’s estranged sister Jules comes to care for her niece Lena and is met with a myriad of mysteries. Master of suspense Paula Hawkins keeps readers guessing throughout this chilling tale where everyone has a secret they don’t want to tell. 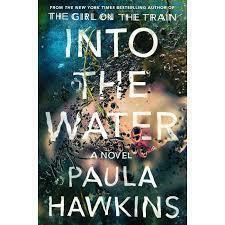 Maribel: I loved this book. It was awesome. Jake: It had short chapters, and it was easy to keep reading. The story kept me turning pages, but it was missing some connection to the characters for me. Kari-Jo: It takes you right up to the end. You keep thinking it’s going to be someone different. Everything in that town seemed to go back to the water. It was an important part of the story. It was both celebrated and sad. The water was its own character. The dystopian society Atwood creates is chilling as she turns the role of women upside down. 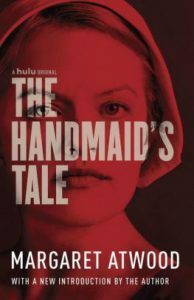 The story follows Offred in her role as a handmaid for a commander and his wife. Her memories of the time before her life was taken over are vivid and create a painful contrast to what her life has become. Kari-Jo: She had a poetic nature to her writing. Sara: At the time that the author was writing this, there was more of a literary style than we have in fiction now. Now it’s not very poetic, it’s more literal. Jake: The writing stands the test of time, it easily could have been written recently with very few changes. Sara: The story is scary, because it could happen. There you have it, DutchCrafters Christmas Gift Book List. We’re currently reading Next Year in Havana by Chanel Cleeton. What have you been reading lately? We’d love to hear your recommendations for our next book club read.